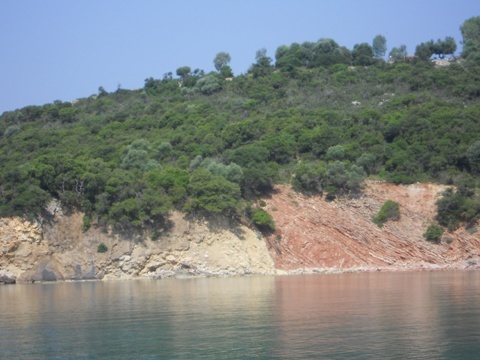 The next day we headed north to Goat Bay as the following day we were going to Lefkas to have some repairs carried out. On arrival at Goat Bay Ann announced that the 'down' button wasn't working on the windlass remote control. No problem I thought, not as tiresome as the 'up' button not working, we could simply release the clutch on the windlass and lower the anchor manually. Except that the clutch was seized together - we haven't used it for two years. After some minutes of 'encouragement' with a specialist tool (i.e. the biggest screwdriver in our tool box) and not a little cursing I managed to free the clutch and Ann was able to lower the anchor in a controlled fashion manually. 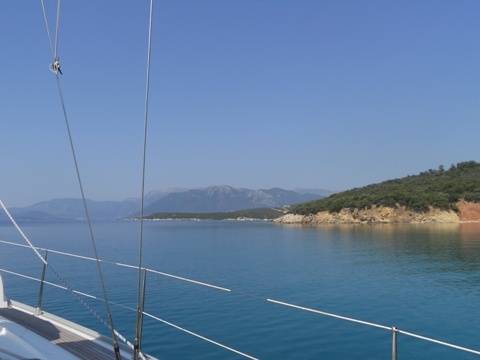 On Tuesday morning we made our way north through the Lefkas canal to the marina. Within a couple of hours Dimitri (and his colleague Dimitri!) from Waypoint Sails were aboard and wasting no time at all set about replacing our combined deck & steaming light unit, the sealed beam of which was full of water. Dimitri #1 then moved to the top of the mast and fixed the wiring so that we now have an operational masthead anchor LED once again - we have been rigging a temporary one for the last two years after two people have tried and failed to fix it. Dimitri didn't do anything that I couldn't have done, if the problems were at deck level rather than 15 metres up in the air! 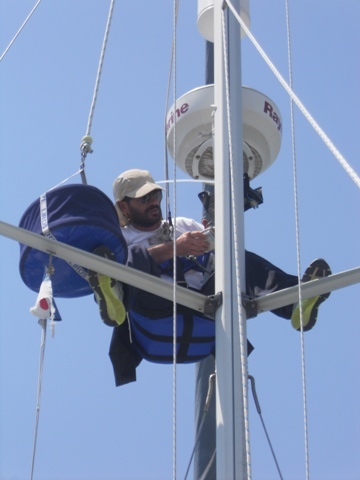 He did, however, have the best and most comfortable looking bosun's chair I've ever seen, he had all the tools necessary to hand in an excellent canvas bucket, and seemed perfectly at home working at the very top of the mast - that is what we were paying for! 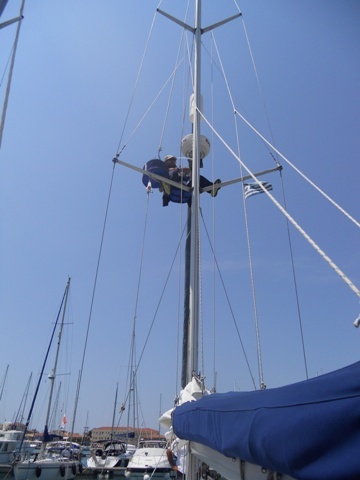 Dimitri & Dimitri then set about replacing part of our gooseneck (the joint between the mast & boom for our non-sailor readers) which had become worn, fortunately having the required part in stock. All in all excellent, careful service from Waypoint, and a 10% discount for being Cruising Association members - we'd thoroughly recommend them. As we were in Lefkas, we took advantage of Carrefour and a couple of other supermarkets and stocked up on food not readily available elsewhere. We also visited a number of chandlers to investigate antifouling and a new freshwater pump. On Thursday morning we made our way back down the canal and there was enough wind for us to raise both sails immediately upon passing the final channel marker buoys. It was about then that we first noticed a curious smell - a heady mix of hot machine oil and cat tinkle. First it was in the cockpit, then down below - very mysterious. I checked the engine compartment, all seemed well. 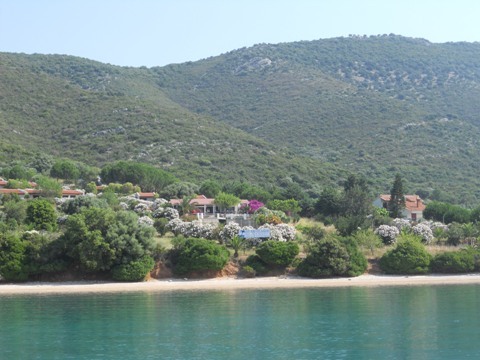 We continued on our way towards Ormos Varko on the mainland and gradually the smell subsided, and so far hasn't returned - any ideas? We stayed at anchor for 3 nights, enjoying the kind of time we signed up for - no crossed anchors, no thunderstorms, nothing broke, failed or fell off and all was idyllic - regular readers will know that it ain't always so... The full moon was so bright that we didn't need our solar cockpit light. We also had the excitement of simply being able to flick a switch and have a light come on at the top of our mast - whatever next! Interesting rock formation in Ormos Varko. The view from our cockpit. Looking across to Goat Bay and the mountains of Lefkada beyond.